Next Dimension Imaging, a leading provider of educational 3D anatomy software develops and markets products which are highly suitable for Interactive Whiteboards. A multi-window technology which was specially developed for visualization and interaction with human anatomy model s is the base for a new, entirely visual user interface. The operation of the program is so intuitive, that it is quickly understood by students. Students can put together and take apart an anatomical model quickly by touching single bones or muscles represented in window tiles. The operation of the program is so intuitive, that it is quickly understood by students. The user interface of the program has almost no button, while selectable window tiles are showing single bones muscles and other anatomical structures, function like a visual menu. The resulting model section is always automatically sized and focused and displayed in the main window for 3-dimensional exploration. Due to a fundamental new model visualization technology in Next Dimension Imaging’s products, not the 3D model is in the center of consideration, but the 3D-view. The software allows managing 3D-views similar to managing files. Views can be quickly created, name labels and commenting notes can be added and saved. This feature is most helpful for lecturers and biology teachers. Lessons can be well prepared by adding content to 3D-views and saving the views for quick recall while lecturing. Used on interactive whiteboards the software facilitates active student participation. It is used for quizzing and exercising and contributes to lectures with impact. Students can interactively add names in 3D space. 3D labels attached to structures are automatically hiding for obscured structures. Spatial labels are hi-tech successors of drawing legends and legends on illustrations which help students to understand anatomical content for thousands of years. Auto-hiding spatial labels have become possible by the vendors advanced labeling system developed for educational 3D visualization. Next Dimension Imaging has comprehensive experience in 3D visualization technology for various medical 3D anatomy imaging modalities. 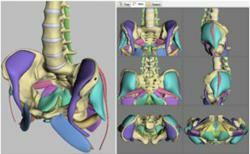 The vendor has pioneered anatomical 3D model visualization and combined it with modern online information technology. Core of its products is a 3D viewing engine which provides the infrastructure for multiple 3D windows, view management, auto-colorization and spatial annotation. Products cover skeletal and muscular system, circulation system, nervous system, ligaments and inner organs. They are used by university lecturers, high school teachers and students. A free demo program which demonstrates some of the product features can be downloaded at http://www.nextd.com. For further information, contact Lothar Muench at info(at)nextd(dot)com.